Okay, so this is scary. I bought my bikini, it's a size 10, I really like it but it's blatantly too small for me, ha! I thought I'd get a colour other than black, one of my new year's resolutions for 2009 (other than the obvious shaping-up!) has been to wear more bright and daring clothes... resulting in my trawling through various retro clothing shops and wearing 80's style lurex tops to work, haha... my poor colleagues!! 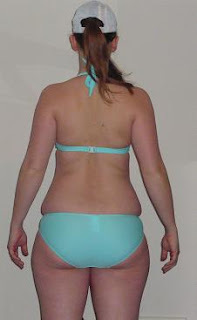 I don't think I've ever had back-fat before, so this is something new, and not welcome in the slightest! The double-chin action is not appreciated either. It's also shocking how bad my posture is, and I'm pretty sure I could pass for 5 months pregnant!! Over my body I've lost 1.5", but gained an inch, so only half an inch loss to report. Still, not bad for someone who has been more or less a couch potato for the past two weeks! I won't be able to train properly until after I've handed my next assignment in on Tuesday so probably won't be a huge difference to report next week either, but we shall see!! The color of that bikini is awesome! Good luck with your weight loss goals!! With the active lifestyle you described in your first post, you'll be in awesome shape in no time at all. All the best with your fitness goals, i'm sure you will do really well.